Fold ribbon in half. Tie ribbon onto the paper clip using a half hitch by putting the loop end of ribbon through the center of the paper clip, then pull loose ends of ribbon through the loop and tighten. Add the silver bead onto the loose ends of the ribbon and slide bead down to the knot. Depending on the size of the hole in the bead, you may need to use a craft needle to add the bead onto the ribbon. Determine the desired length of the ribbon and tie an overhand at the top and trim. You may want to add a drop of glue to the bead to keep it from sliding. 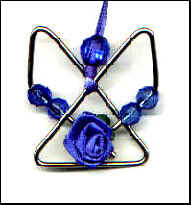 Make Birthstone Angels by changing the silver bead to a 8mm faceted bead and adding matching beads, ribbon and a ribbon rose to correspond with the birthstone month. Just slide two beads onto each side of the paper clip. To add the ribbon rose, tightly wrap the entire stem around in the middle of the clip (where indicated in picture) and trim off excess. 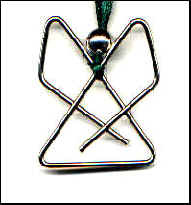 (September Birthstone Angel is shown).